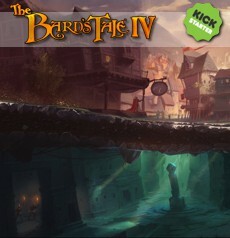 This is the followup official release from inXile Entertainment and Brian Fargo under the "Bard's Tale" brand. As a service to fans, the original classic trilogy is also included as playable sub-games within BT04. If you want to support inXile and properly pay for Bard's Tale 1-3, as well as enjoy what gaming goodness BT04 has to offer, this is the choice for you! Free for backers of the Bard's Tale IV Kickstarter campaign, inXile has re-packaged and re-released the MSDOS versions of Bard's Tale 1-3 in a single downloadable bundle, which has been made available at the Backer's Portal site. In 1993, Interplay compiled a collection of classic of games celebrating 10 years. Included in the anthology are Mindshadow, Tass Times In Tone Town, The Bards Tale, Battle Chess, Wasteland, Dragon Wars, Castles, Lord Of The Rings, Star Trek 25th Anniversery, and Out Of This World. This anthology is still available for purchase from Amazon.